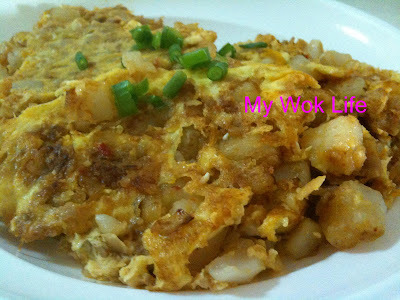 Fried carrot cake is also known as “Chai Tau Kway” (菜头粿, Chinese pronounced as: Cài Tóu Guǒ). Not the usual sweet dessert, but a kind of Chinese steamed carrot rice cake. This is one of the all-time favourite local delicacies in Singapore, and it is one of the Teowchew delicacies. That’s why we usually call it Chai Tau Kway, a pronounciation in Teowchew dialect. In Singapore, there are mainly two types of Fried carrot cake selling at various hawker stalls and food court. Generally, the “white” carrot cake is more popular than the “black” one here. 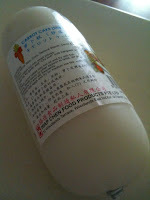 In fact, only Singapore has the “white” version of carrot cake cooking method, I believed (smile). This unique “white” colour frying method simply refers to frying without dark soy sauce, while the “black” carrot cake will be added with dark sweet sauce, and such “black” version is more porpular in Malaysia instead. 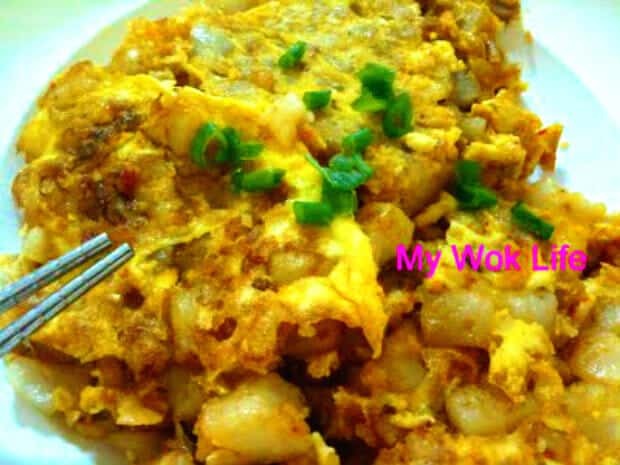 This Singapore hawker-style (pan) fried carrot cake can be assembled easily, with just a few Asian staples in your kitchen, but first of all, you have to be able to make or buy the ready made steamed carrot cake. I cooked this at home as lunch last Saturday, with the ready made carrot cake bought from supermarkets, for the purpose of making this an express lunch meal, which took me only 20 minutes to get it served (*making the cake at home takes additional 45 minutes to prepare). If you are staying outside Singapore, and can’t find those ready made Chinese carrot cakes in the Asian markets. Not too worry, make your own carrot cake over the weekends. You may keep the steamed cake refrigerated for days before frying it. 1) Rinse a few times, or steep chopped preserved radish in a bowl of water for 5 minutes. Drain well (squeeze to dry) and sprinkle few drops of sesame oil. Reserve for later. 2) Heat wok with 2 tablespoons of oil over high heat. Add in diced carrot cake and sauté for about 8 minutes, or until softened and lightly browned. Stir-fry accassionally to avoid sticking. Heat off, and set aside. 3) Heat a large frying pan with 1 tablespoon of oil over high hear. Add in garlic and stir fry till fragrant. 4) Add chopped preserved radish and stir fried till fragrant and looks grossy. Then, add in chili paste. Return sauteed carrot cake and stir fry to combine well. Drizzle some oil if finds too dry. 5) Drizzle fish sauce, stir fry a few times, followed by adding of light soy sauce and sugar. Stir fry to combine well. Then, spread the carrot cake pieces nicely on the pan, and lightly press with the back of the spatula. Let it pan fry for 1 – 2 minutes. May drizzle more oil or just water to moist the carrot cake. 6) Break eggs into a small bowl and beat it lightly with a fork. May add some light soy sauce and pepper, if desired. Pour eggs solution over the carrot cake. Let the eggs set and cook (without stirring) till semi done. Divide the carrot cake to quarters using the spatula, for easy flipping. Flip over the carrot cake portions, and let it cook till both sides are cooked and golden browned. Heat off. Transfer to serving dish, garnish and serve hot. “White” fried carrot cake uses lots of eggs, with some chopped persevered radish, it helps to release the aromatic scents that will mingle in the palate for a while. However, this can only be eaten moderately and not too often as this imbalanced diet dish is usually cooked with loads of oil. But, of course, you can always restrict yourself from adding so much of the oil in your food (smile). Look at this goodness again… It was very fragrant and yummy with the home-cooked flavour (ha ha)..
A portion of this Fried Carrot Cake counts about 450kcal. Tips: I got the readily made and packed chilled carrot cake from NTUC Extra. It can also be found in many other supermarkets in Singapore. * If you find the carrot is too sticking, add more oil to fry. * Steep the Chai Po for longer time, in order to eliminate its high salt content. Do a taste check on the steeped Chai Po. If you find the Chai Po is still taste salty enough for you, do omit the additional salt content of fish sauce and light soy sauce in the cooking. * The amount of salt content (i.e. fish sauce and light soy sauce) is adjustable to your liking. Different individual has different tolerance level for salt. To ensure the best right taste, add the amount in stages. Do taste check. **Thanks to Joseph for bringing this up! Anyway hope your week has been good and keep on cooking and posting on yr blog!! Glad to know you cooked well and so likeable by your loved one..
Did I add too much water? And do I have to boil the carrot till the water is dry or does it have to cool a little while before I pour it into the rice flour water mixture? Your comments and suggestions will be a great help:) thanks! 1) less water. Never simmer the carrot cake with water. It’s just for sprinkling to wet. 2) more oil. Re-drizzling some oil as and when during cooking. 3) pre-sautéed of the carrot cake may help to firm your carrot cake. Place the carrot cake on a layer of heated oil in the pan and sauté on low-medium heat till lightly browned before adding condiments/ flipping and stir-frying it. 4) adjust the heat constantly. Need high heat for quick stirs, low heat to sauté after topping the beaten egg, especially. My wife followed this recipe to the letter and it was too salty! I noticed at least 3 tablespoons of salt content (fish sauce, soy sauce). With the chai por, this is way too much. Couldn’t be rescued so we threw it away. I think what you meant to say is ‘teaspoon’? Oh, let me check again? I checked and recalled this should be it. Just double check with you, did you steep or rinse the Chai Po a few times? It could be due to the chai po. Different brand of chai po requires different level or duration of steeping, too, in order to eliminate its saltiness. The chai po I had for this recipe was steeped to almost bland. Plus the fact that carrot cake itself taste bland, too. The amount of saltiness in my recipe should be fine. That’s how I derived the recipe content. Also, there might be other factors like the tablespoon used, etc. I used metal spoon instead of soup spoon. Hence, I would suggest adjusting the amount of salt content to your desire, by adding the amount in stages, if necessary. You may also want to steep a little bit long for the chai po. If not, totally omit the additional salt content, if you tried the steeped chai po by abit, and find it salty enough for your liking. I will also amend my post to add a note to this. Hope this helps! Hi there. Tried to cook this in a wok but the egg does not stick to the carrot cake. Tastes great though but doesnt look anything like in your photo or the stuff they sell at the hawkers. Do i need to use a non stick pan? Thanks. Non-stick Pan will help for sure. The eggs you add have to be left still to set before stir frying it too quickly. Don’t quick stir the carrot cake, but gently flip over in batches.